On a battlefield trip some years ago, I visited Petersburg, Virginia, the home of William Pannill V and his wife, Eliza Binns Jones. Petersburg was the birthplace of my great-great-grandfather Henry Pannill, their second son. I knew almost nothing of the rest of the family or the town. I knew only that the Union Army had besieged Petersburg from June 1864 to March 1865. I learned that William V – a veteran of the War of 1812 and a graduate of William & Mary College – had been commissioned a colonel of militia as provost marshal of Petersburg and served throughout the war. He had served in the 1840s as president of the Southside Railroad, which later became a crucial supply line for Petersburg and Richmond. He was also mayor of Petersburg and a commission merchant. graves of Confederate soldiers, most of them unknown. It is one of the loveliest cemeteries in the country. The cemetery began as the graveyard of Old Blandford Church of Bristol Parish. 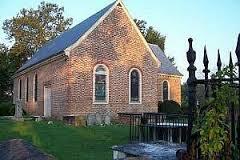 That was an Anglican church built in 1735. The Anglicans abandoned the building in 1806 with the building of a new Episcopal church in Petersburg. In 1900, the Ladies Memorial Association, which had begun Decoration Day in 1866, turned the old Blandford Church itself into a Confederate shrine with stained-glass windows by Louis Comfort Tiffany. The grave site has fallen into disrepair in the past 173 years. 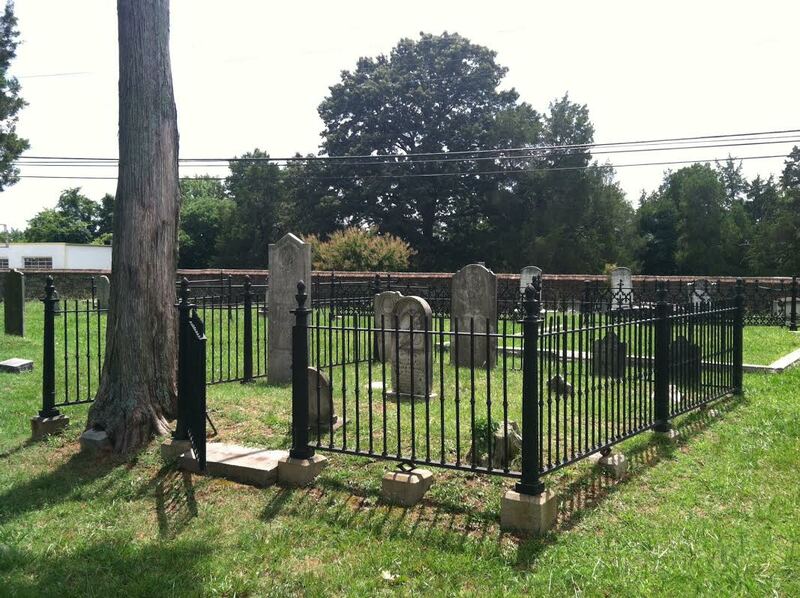 A wrought-iron fence that surrounded the graves lost a section to a volunteer tree. The tree also dislodged the gate, which now hangs at an angle and does not close. Gravestones appear to have fallen over. The ladies association maintains a gift shop next to the cemetery. They sell Blandford Cemetery: Death and Life At Petersburg, Virginia, by John O. Peters, a beautiful color book published by The Historic Blandford Cemetery Foundation, Inc., in 2006. 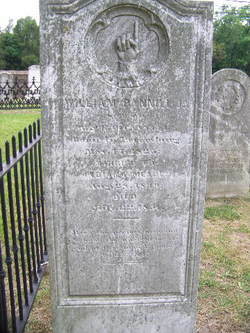 Gravestone of William Pannill, Jr. In the book I found a striking photograph of one of the Pannill graves, that of William Pannill, Jr. The relief pictures a finger pointing to heaven. 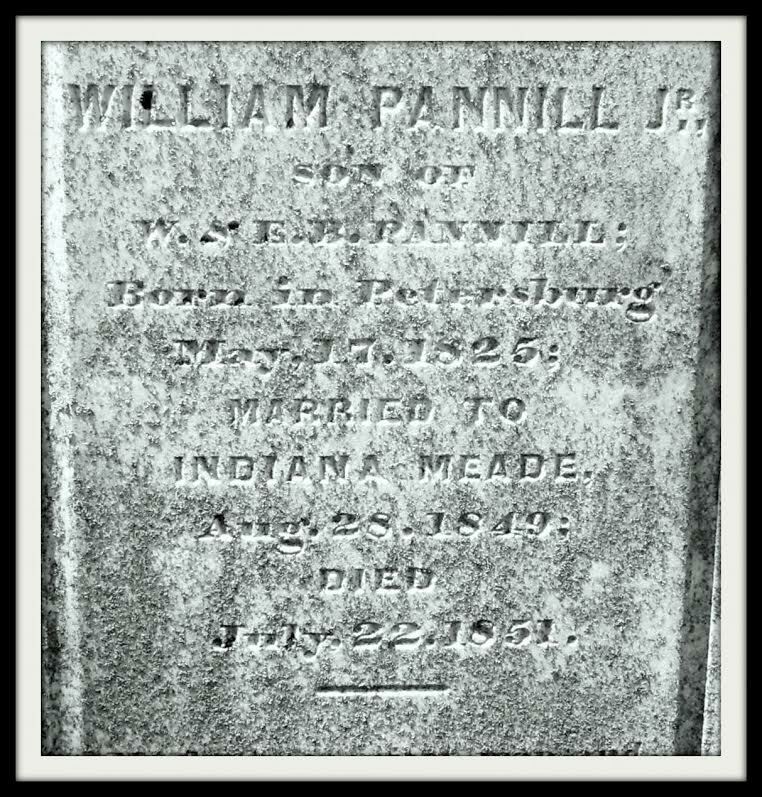 It was the grave of William Pannill, Jr., born in 1825. On a visit four years ago, I asked the volunteers how we could restore the Pannill site. They directed me to Delk Granite Works across the street, but when I arrived, the office was closed. Then I went home and misplaced the name and number. In late July of this year, on my way to the biannual reunion of the Pannill family in Orange, Virginia, I tried again. This time I met Bill Delk, a delightful man with the broad accent of Southside Virginia. He directed me to “B” Brown at the Historic Blandford Foundation (www.hbcf.us), who has been working to renovate grave sites at the cemetery. Mr. Brown said his crew would be excited to work on the Pannill site, because most of the dead whose graves they restore have no descendants. The Brown team is beginning work on the original Pannill site. The site lies about 25 yards from Blandford Church toward Crater Road (I have a map, as does the cemetery office). The gravestones they will right and clean. The markers I thought were fallen gravestones turn out to be foot stones, which they will set back in place. Mr. Brown estimates the cost of restoration of the iron fence at $1,400. I promised to make a donation to the Blandford Foundation to help with the cost of the fence restoration. If anyone – and especially descendants of William and Eliza Binns Pannill – would like to contribute, there is a form at http://www.hbcf.us/foundaton. William Pannill, Sr., 1794-1870. This is the grave of William Pannill V.
Eliza Binns Pannill, 1804-1848, his wife. My aunts all referred to her as Eliza Binns Jones. I believe that was because she was the granddaughter of a Revolutionary hero, Colonel John “Hellcat” Jones. He served in the House of Burgesses, led a militia unit of cavalry in the war, and after the war was elected to the Virginia Senate, where he served as president in the 1780s during the debates on the Constitution of the United States. 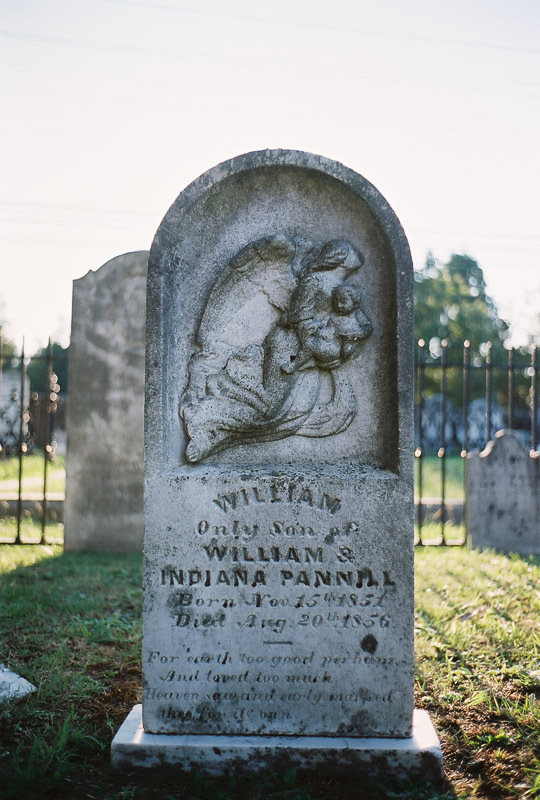 FIRST RESTORED GRAVE STONE: WILLIAM PANNILL, Jr.
William Pannill, Jr., their oldest son. He was William Pannill VI. He was born May 17, 1825, in Petersburg, graduated from Princeton University, and married Indiana Meade on August 28, 1849. He died on July 22, 1851, at the age of 26. Otey Pannill, another son of William Pannill and Eliza Binns Jones. His gravestone is almost illegible, but a WPA project in the 1930s copied inscriptions from hundreds of Blandford graves. This is one of them. I found a copy of the typed manuscript in the Library of the Virginia Historical Society as Blanford [sic] Cemetery Epitaphs (the book is on line). Otey was born December 27, 1837, according to the WPA manuscript, and died March 28, 1841. He was apparently named for the Rt. Rev. James Hervey Otey, Episcopal Bishop of Tennessee in the mid-19th century. Bishop Otey – then a teacher of Latin and Greek — had married Elizabeth Davis Pannill, the daughter of William Pannill IV and Martha Mitchell. On March 28, 1841, Otey Pannill died. He was four years old. Edwin Pannill, another son of William Pannill and Eliza Binns Jones. The WPA manuscript gives his birthday as September 27, 1837, but this is surely wrong – perhaps a typographical error. Eliza Binns Pannill could not have borne one son in September 1837 and another in December 1837. Perhaps they were twins and the typist misread the dates. It will take more research to establish their correct birth dates. The WPA Guide gives March 20, 1841, as his death date, eight days before his brother’s. months after the death of his father. This little boy was William Pannill VII. He died on August 20, 1856 – just three months before his fifth birthday. His grandfather survived him by 16 years. These graves show that he had lived through many sorrows.